Jewish Home tops Labor in latest election poll, as party rebounds following loss of party chief last month. Sixty-four days out from the elections for the 21st Knesset, Prime Minister Binyamin Netanyahu’s Likud party remains well-positioned to secure an additional term at the helm of the Israeli government, though challenger Benny Gantz continues to gain ground on the incumbent. According to a poll released Monday, the Likud would remain the largest faction in the Knesset if new elections were held today, winning 30 seats – the same number the party won in 2015. 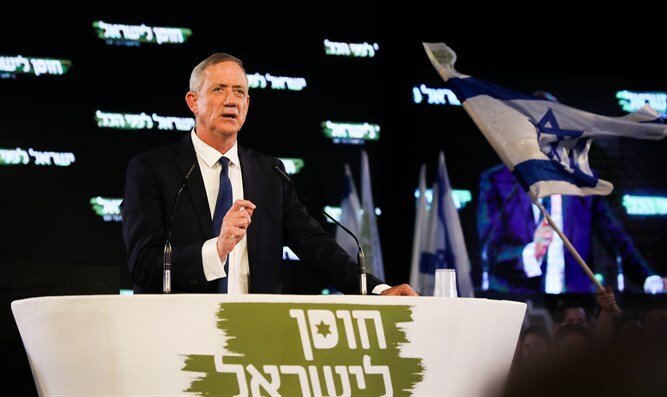 The survey, which was conducted by the Dialog firm under the supervision of veteran pollster Camil Fuchs for Haaretz, also found that the Israel Resilience Party (Hosen Yisrael), led by former IDF Chief of Staff Benny Gantz, continues to gain ground following its merger with former Defense Minister Moshe Yaalon’s Telem faction. While previous polls showed the joint list winning between 19 to 21 seats, the latest poll gives the joint ticket 22 mandates. Former Finance Minister Yair Lapid’s Yesh Atid party would come in a distant third with just nine mandates, down from the 11 it won in 2015. Education Minister Naftali Bennett’s New Right would win seven seats if new elections were held today, up from the three it currently holds, after three members of the Jewish Home broke away to form the new party last month. Bennett’s former party, the Jewish Home, gained ground in the new poll, rising to six mandates – the highest in any poll since Bennett split from the faction. The Jewish Home won eight seats in 2015, but fell to five seats, following the departure of Bennett, Ayelet Shaked, and Shuli Muallem to form the New Right. Yisrael Beytenu would win five seats, one less than the party won in 2015, while Finance Minister Moshe Kahlon’s center-right Kulanu would plummet from 10 seats to just 5 if new elections were held today. Among the haredi factions, United Torah Judaism would retain its six seats, while Shas would fall from seven to five. Former Yisrael Beytenu MK Orly Levy’s new Gesher (Bridge) party would win four seats, barely clearing the 3.25% electoral threshold, while Tzipi Livni’s Hatnuah would fail to enter the Knesset. Labor, which currently holds 18 seats, would fall to just five, the poorest showing in the party’s history. The far-left Meretz party would lose a single mandate, falling from five to four, while the predominantly Arab Joint List would win seven seats. The former Joint List partner, Ta’al, headed by former Yasser Arafat adviser Ahmed Tibi, would win five seats. Otzma Yehudit, Zehut, and Yahad would all fail to clear the 3.25% threshold. Prime Minister Binyamin Netanyahu would have the clearest path to forming a majority coalition, according to the poll, with 64 seats going to parties which were members of the Netanyahu government prior to Yisrael Beytenu’s departure in November of last year. That represents a two-seat decline from the coalition’s 66-54 majority from 2016 until November 2018.